This article on Brocks Illuminations at Crystal Palace in 1906 first appeared on the Friends of Crystal Palace Dinosaurs History Blog in July 2013. 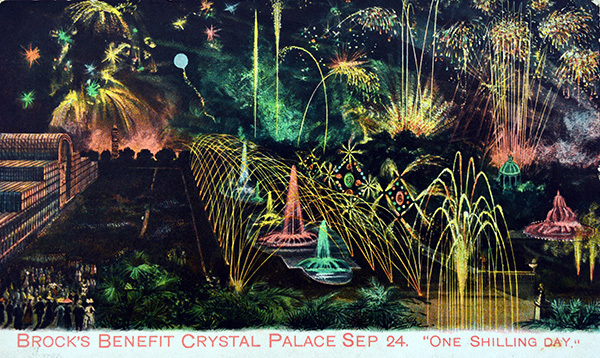 Close study of the fabulous and rare 1906 postcard from Brocks Fireworks Ltd – advertising their “Illuminations” at Crystal Palace – features many animals, including a pterodactyl and several dinosaurs. Among these, one is a Diplodocus. That’s notable because one had just been presented to the British Museum (Natural History), now the Natural History Museum, as a gift from Andrew Carnegie, see Nieuwland 2010). There also appears to be a Plesiosaurus and perhaps a Dicynodon, two of the Crystal Palace dinosaurs (even though they are not dinosaurs!). These animals were not fireworks, but “illuminations” – electric light displays place in and around the fountains. These were popular attractions at a time when electric lighting was far from common. Brocks Fireworks were famous for their Guy Fawkes Night fireworks displays. The company distributed postcards about these events – flagships for the company. Another one is shown here. Brocks Fireworks Ltd is still in business. It begin in 1698 (history). Another copy of the same postcard is available here. Thanks to Dr John Taylor (NHM) for donating the Illuminations postcard.